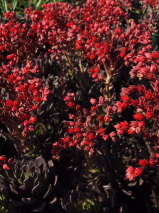 Striking low growing succulent with dark chocolate coloured leaves forming a group of rosettes. Tall stems of red flowers in spring. Hardy to light frosts, it prefers a sunny site. Small, height less than 0.23 metres.